This organ seems to have started its life at Cheshunt Great House in Hertfordshire. In February 1906, the organ was photographed for an article in The Connoisseur and was attributed to one of Wolsey’s monks. 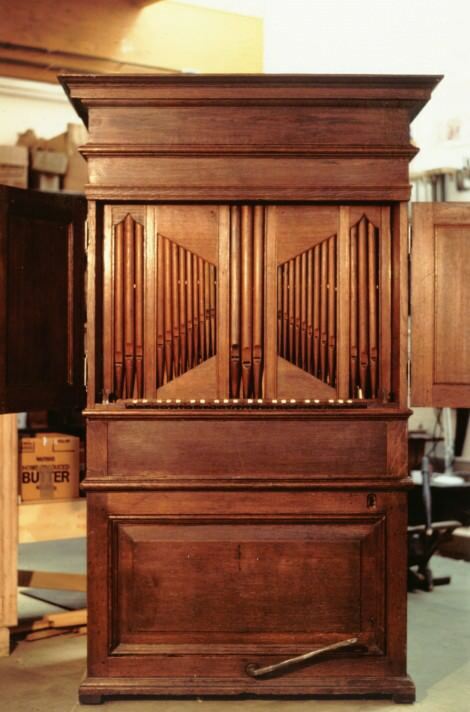 It actually dates from the late 17th century, and is one of those chamber organs thought to be by Father Smith. In fact they were made in a traditional English style, long before father Smith came to England. They were used for household music, either sacred songs or for accompanying viols, or as solo keyboard instruments. This organ was first recorded by Thomas Green, who tuned it in 1753. In 1851 it was repaired by the organ builder Kendall of Kensington for a Dr Mayo, who had inherited the House. It then passed with the house to Bishop’s College, an Anglican training college and it was at Bishop’s College that Colin Tilney found the organ in 1964. He had it repaired by Alan McKirdy, according to another inscription in the bellows, used it for some time as a continuo instrument, and sold it to the National Trust in 1984, https://www.nationaltrust.org.uk/canons-ashby when we restored it. It is now in the Drawing Room at Canons Ashby. The compass was originally C/AA/D – c³, now C – c³. The bass and treble stops divided at c¹/c#¹. The pitch was originally about a semitone above A440.